I got an Instant Pot on sale on Black Friday, and after a few easy things over the weekend I was ready to try a more ambitious meal. I was pretty nervous because I couldn't find a recipe for exactly what I wanted to do, so I had to combine different things, but it turned out perfectly. We'll definitely be making it again! I used the pot-in-pot method to cook the rice separately from my chicken. After playing around with different stuff I had on hand, I ended up using the liner from my old rice cooker to be the rice pot, but any oven-safe container will do; I also had a Pyrex bowl that was pretty close to the right size. 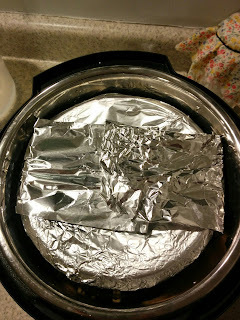 The instructions I use here are specifically for brown rice and frozen chicken breasts. If you're using thawed chicken and white rice, your rice will need less water (most ratios I've read suggest 1:1 for pot-in-pot white rice) and a shorter cook time (probably more like 12-15 minutes). 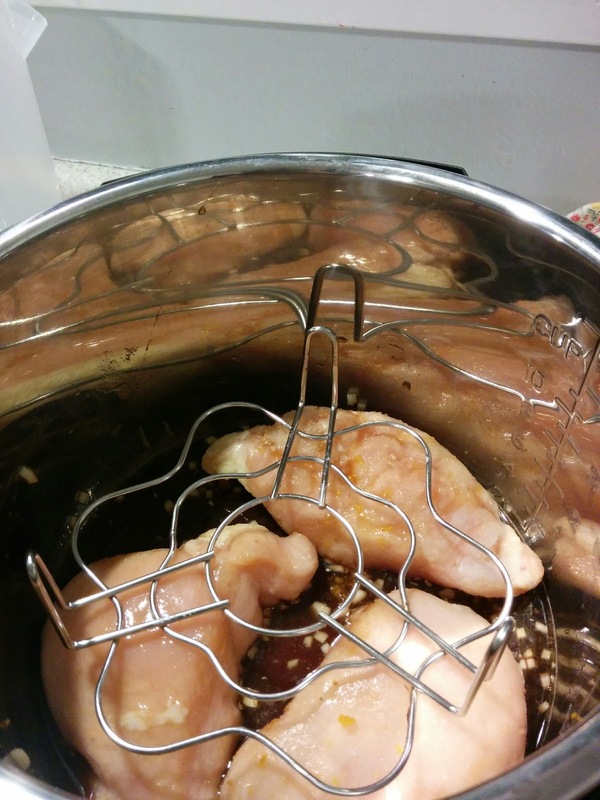 Mix together soy sauce, vinegar, apple juice/water, honey, pepper, sesame oil, and garlic. Place sauce and frozen chicken breasts in bottom of pressure cooker. Rinse rice and place in smaller oven-safe bowl or pot (test to make sure that your inner pot will fit inside your pressure cooker, on top of the chicken, without overfilling the cooker), with the water. 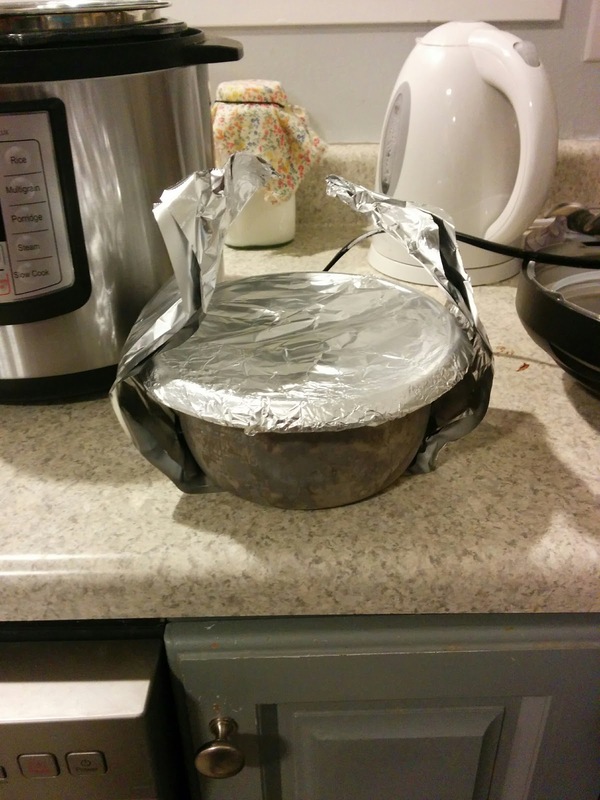 Cover with foil and if your inner pot doesn't have a handle, use tin foil to make a "sling" to go under the pot for easy removal. I used the liner from my 6 cup rice cooker for my inner pot. Here it is covered in foil with a folded-tinfoil sling. it hits right at the Max Fill line. Put on pressure cooker lid and cook for 23 minutes. (It took mine about 10-15 minutes to come up to pressure at the beginning.) 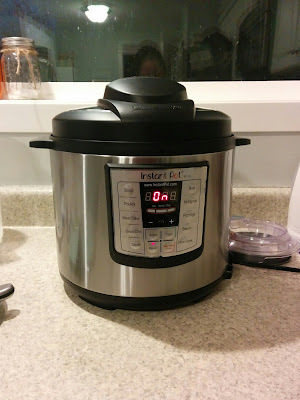 I am not familiar enough yet with my Instant Pot to know the ins and outs of pressure releases, so I'm not sure if there's a specific method that works best with this recipe, but I ended up letting my pressure cooker sit for between 5 and 10 minutes and then letting the rest of the pressure off with the quick release valve because we needed to eat right then. ;) It worked great and I did NOT make the pot explode! It was cooked enough that I suspect it would be fine to do quick release from the start, but also fine to leave it on warm and let the pressure release naturally if you want to keep it warm for awhile. Everything about this meal was perfect—the chicken was cooked perfectly, the rice was excellent, and the teriyaki sauce is the best I've ever made and one of the best I've ever tasted. I've been trying all year to imitate the sauce from my favorite teriyaki joint, and while this wasn't quite to that level, it was pretty darn close! There are some resolute corners and spots of the stairs that don't get wiped off effectively; in such cases having a little estimated vacuum cleaner that is anything but difficult to bear is only the sort of thing you need to enable you to do your cleaning work flawlessly.